Let's talk soup. Soup is an underrated dish. I love soup. 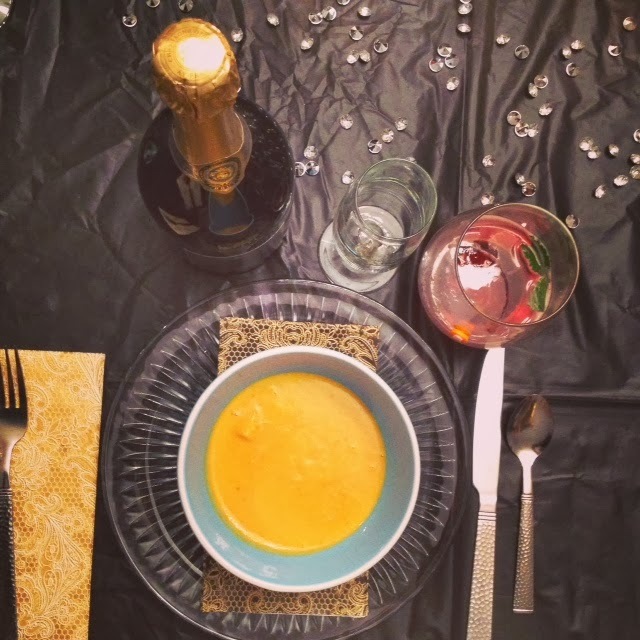 So for the first course of the New Year's Eve meal (after the appetizers of marinated olives and artichokes and deviled eggs) we had Butternut Squash soup. It was so easy and absolutely a must-try for any foodie. And not to brag, but the guests loved it. And for anyone who worries about taking on too much when hosting a party, it can be made the night before and reheated. So really, you have no excuse not to try it. I couldn't find butternut squash in the produce section, perhaps because it's out of season. But then I stumbled upon 3 halves that were already peeled with the insides scooped out so about a half hour of prep was saved for me! Take the easy road if you can and keep your sanity intact. 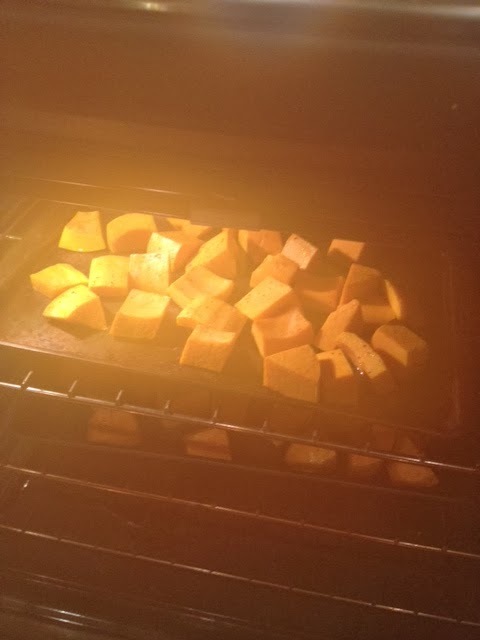 So I cut up the squash and onion into chunks, tossed them around in a bowl with about a tablespoon of olive oil, sprinkled with black pepper and spread them on a cookie sheet. Then I baked them at 325 degrees for about 30 minutes or until they started to turn a little brown at the edges and were soft in the middle. They came out smelling so good that I may have eaten a chunk of onion as is. 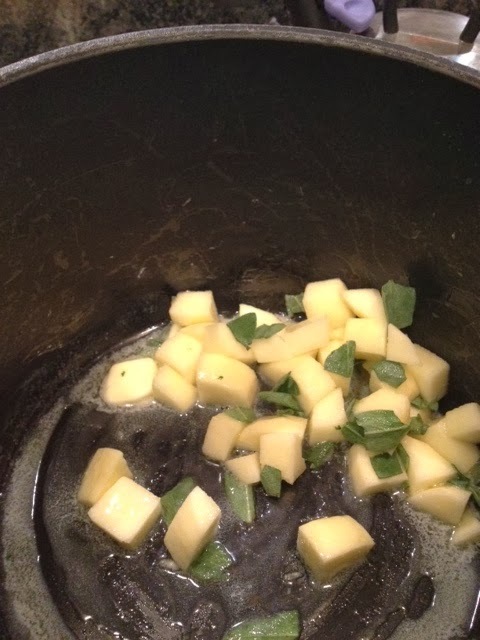 In a large pot melt butter and sautee diced apple and sage leaves over medium heat until apple is soft. I dare you to stick your head over the pot and inhale deeply. It's the most fragrant smell. 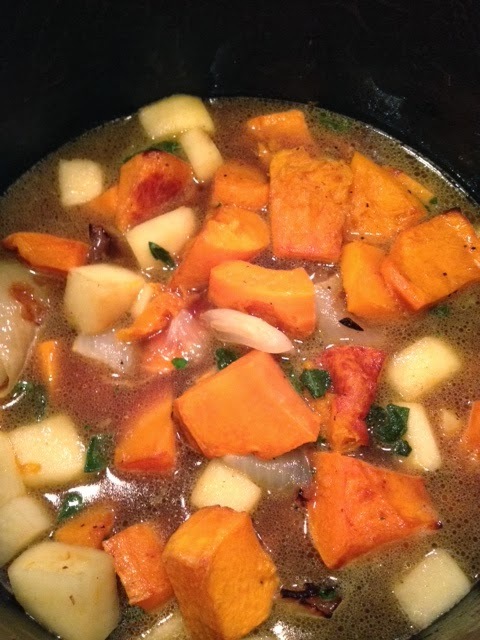 After apples have softened, about 5 minutes, add in squash and onion. Add broth, water, salt and pepper to taste and simmer five minutes or so until everything is a unified temp. 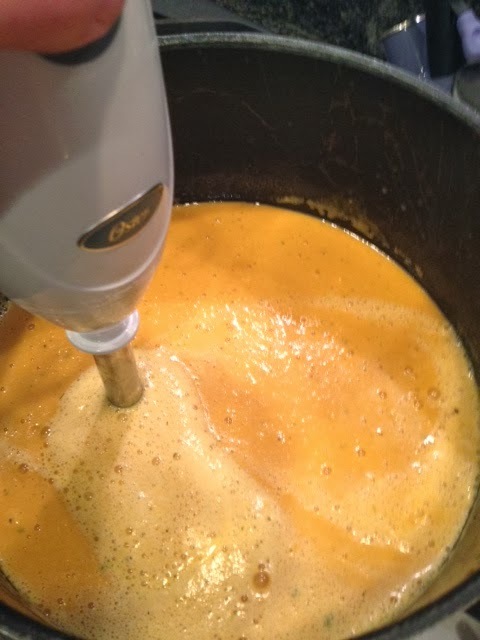 Add cream and then you can either puree in a blender or if you're fancy you can use an immersion blender (which is fancy but not to practical and makes me make a face when I'm afraid it's going to shoot out of the pot and spill on my outfit). 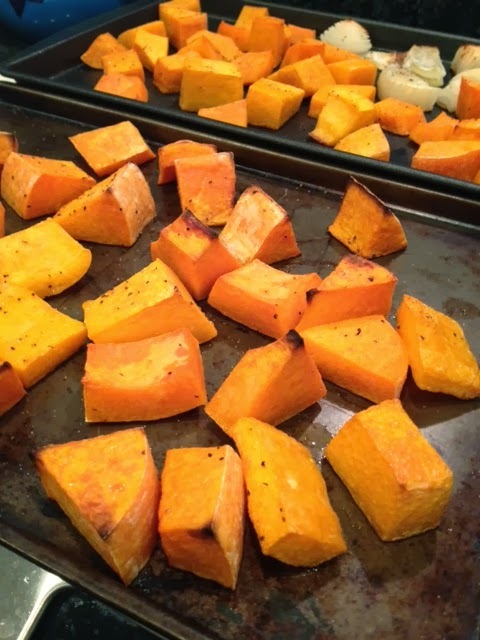 When I had Molly taste it after blending to make sure I wasn't alone in my butternut squash bliss, she said, "Can I live in it?" I'm telling you, you have to make this soup. Your guests are going to think you slaved away in the kitchen for hours. I also cut up a baguette into inch thick pieces, brushed them with olive oil and toasted them so that people could use them as croutons or dippers. This soup was out of this world! It has been awesome as leftovers too, still tasting great a few days later. Now I know you were making that scared face because you wanted to preserve your outfit! This soup was SOOO good! I'm dreaming about it - miam! Can't wait to make it for myself!